Students will learn to recognize and spell sets of words with /shun/ suffixes. 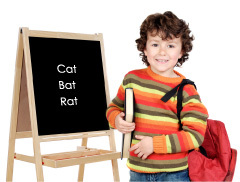 Students will become familiar with common t-i-o-n, s-i-o-n, s-s-i-o-n, and c-i-a-n words. Note: If you do not have the CD or Mini-Charts, you can still teach this -tion suffix lesson plan using the folk tune listed on the Extension Tension Song Lyrics page. You can create your own mini-charts using the words in bold print letters in each verse of the Song Lyrics. Assign partners or study buddies for each student. Say, “I’m going to time you for 1 minute. In that time, you and your partner should state as many words with the /shun/ ending as you can think of. Ready? Go!.” Time the group for 1 minute. Now we are going to toss a balloon (alt. bean bag, ball) from one person to the next. As you toss the balloon to the next person, say one of your /shun/ words. Try not to say any words that have already been said. If you need more time to think of another word, keep the balloon in the air by tapping it over yourself until another word comes to you. Your partner may help you think of a word. Perform this activity. Say, “Who can remember one of the ways to spell /shun/?” (ex. t-i-o-n) “Who can remember another way to spell the same sound?” Repeat this last question until s-i-o-n, s-s-i-o-n, and c-i-a-n are spelled. Turn to page 104 in the Mini-Charts to confirm these four spellings. Tell students that you will replay the song and ask them to join in on the repeated parts. Students should join in on the refrain (Mini-Charts pp. 102, 105, 111, 114) and the verse endings (Mini-Charts pp. 104, 107, 110, 113). Rep0lay the CD track and point to the Mini-Charts. Play the CD and ask students to try to join in on all the words of the song. See if some of the students want to be pointers to the target words on the Mini-Charts. Supervise pointing and page turning. Practice singing Extension Tension daily for a week. Then try singing the song without hearing the words, using the instrumental track (Track 20). Allow different students to point to the Mini-Charts words while singing. Help students create other sets of /shun/ words for the song. Make 13 copies of Mini-Chart template p.118 and allow students write in the new sets of words, duplicating the song’s words only on the repeated parts (See Step 7). Examples: -tionstation, fiction, portion, caution; -sioncomprehension, pension, pretension, convulsion, [Note that many words with -sion endings, e.g., occasion, conversion, begin with the /zh/ sound rather than the /sh/ sound]; -ssionintermission, permission, expression, possession; -cianelectrician, beautician, politician, technician. Place these pages back-to-back in page protectors in a 3-ring binder. Then sing the song with the instrumental version (Track 20). Do a dictionary search for words with each of the four spellings for -shun. Use a dictionary on CD-ROM such as Encarta or use an online dictionary such as www.wordsmyth.net. To search, type in the (wildcard) asterisk (*) character before the ending letters. For example, type in *tion in the Search box. To find words with -sion endings, type in *nsion or *lsion in the Search box. Create a word wall or bullten board with these words in word family groups. Create the Suffix Wrap game by cutting cardstock into four strips. With a hole punch, create four notches on the left side and sixteen notches on the right side. Print word beginnings next to the left notch. Print possible endings next to the right notches. Create a placeholder slit at the top and the bottom of the strip. Use yarn to connect correct word beginnings and endings while wrapping around the card until all have been matched. Use the placeholder slits to secure the yarn at the beginning and the end. (See illustrations at right. Make these cards self-checking by tracing the yarn patterns on the back with pencil or pen. Laminate for durability. Write funny or silly poems with rhyming words that have /shun/ endings. Sometimes these rhyming endings will be spelled the same (e.g., vacation, explanation) and sometimes, the rhyming endings will be spelled differently (e.g., invention, dimension). Illustrate the poems and place in a class book. Students pass a spelling test on the words from Mini-Charts pp.102-114.